Abishai really enjoyed rowing Warm as Wool by Scott Russell Sanders. He's asked to have it read to him everyday for the last two weeks. I'm not sure why he liked it so much. I guess I should have asked him, but I liked it too, and didn't mind reading it over and over. 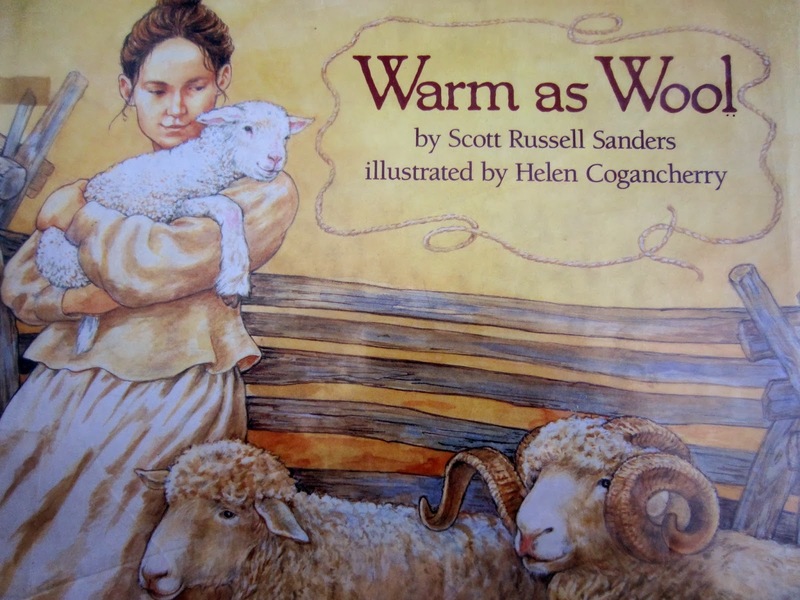 Based on a true story, Warm as Wool is about a pioneer woman determined to keep her children warm with wool clothing from her own sheep. An excellent story about the hardships of pioneer life. We took a look at the covered wagon as the main way for pioneers to travel and transport their belongings from one home to another. We compared their way of moving to the way we transported our belongings when we moved into our house just a little over 6 months ago. This book, The Prairie Fire was about the life-threatening dangers of prairie fires. Abishai learned about how pioneers created fireguards to protect their property from being destroyed. 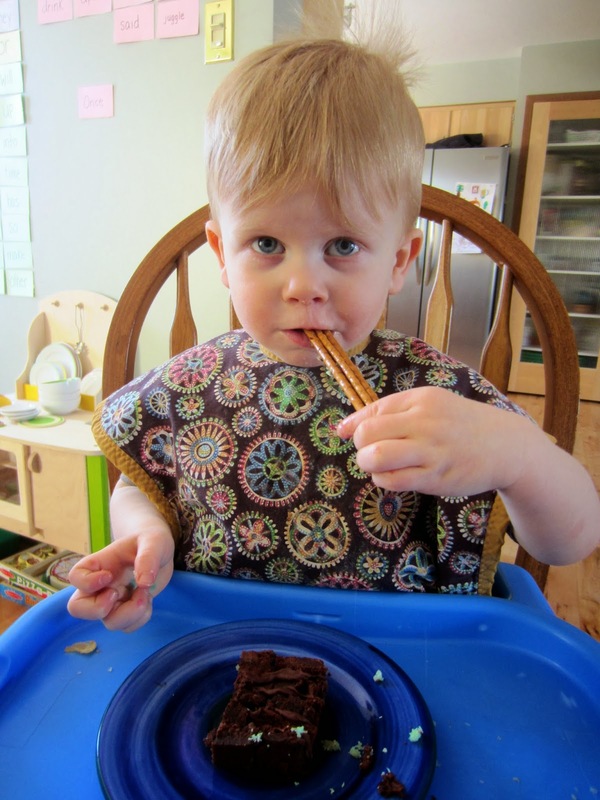 A boy, just a little older than Abishai, takes on the responsibility of putting out sparks landing beyond the fireguard before they grow too big to handle. Another book showing a fireguard being made. We discussed what buffalo chips were from The New Land; a First Year on the Prairie, and how pioneers used them to start fires when trees or wood weren't available to them. Also from The New Land we talked about how pioneers walked around with a freshly cut willow branch to help them find water. When the willow branch bent toward the ground, the pioneer knew to dig a well there. Some homes were 8 paces wide and 6 paces deep. 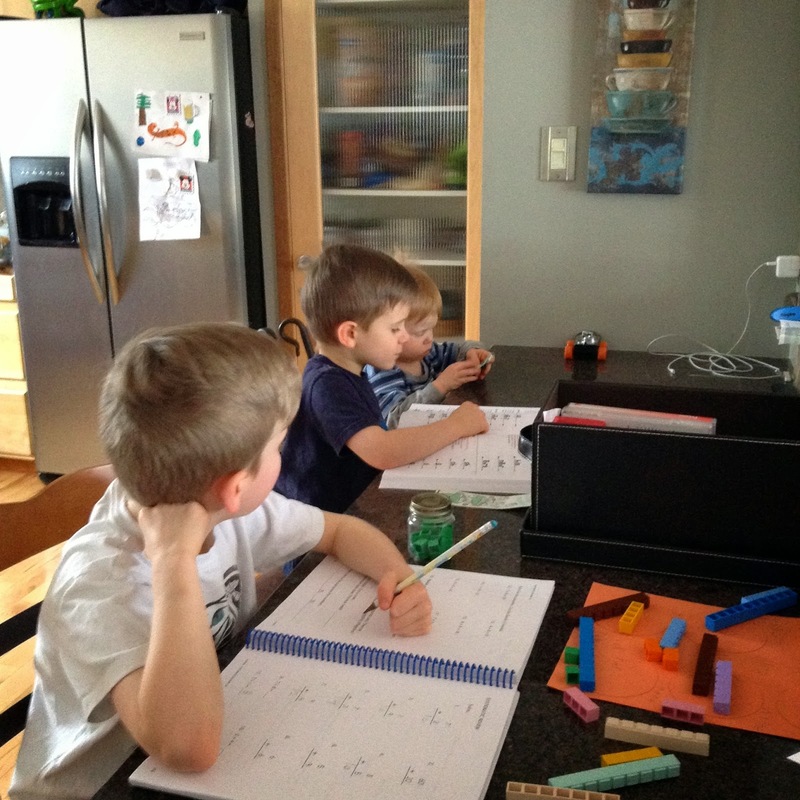 We counted those paces in our living room to discover that their whole home was smaller than our living room. A pioneers home was the width of the dark strips of hardwood you see in the picture but went just a little deeper, to our front window. We talked about what a yoke is, and that when you yoke two animals together, they are bound, and must do things together. 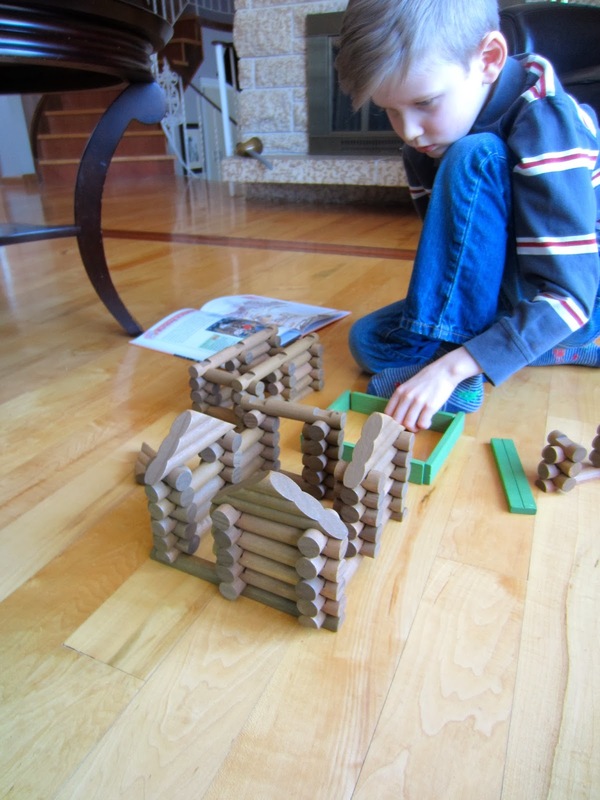 We looked at pictures of their log houses and constructed some of our own from Lincoln Logs. The boys played with the logs for a couple of days. Micaiah made a home, shed and barn. Abishai refused to follow the instruction booklet from the Lincoln Log set. He ran into some difficulties at first, but in the end figured it out on his own. Which he ended up putting a racing track through. New meets old! Down time: enjoying the warmth of the afternoon sun. Lunch time reading (or when we're colouring). 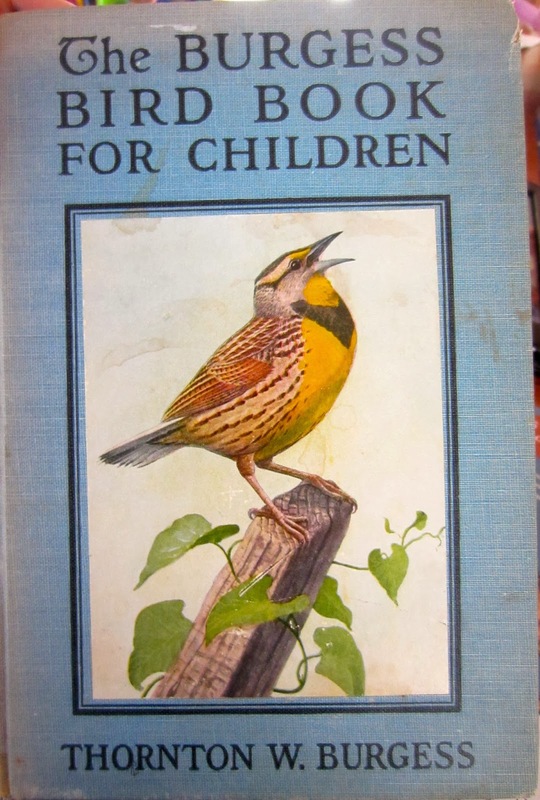 Life Science: The Burgess Bird Book. As we read through the book and came across new bird characters from the story, the boys and I looked them up on our handy dandy iPad to see their colours and hear what they sound like. The iPad chirps their song back to us. So fun! 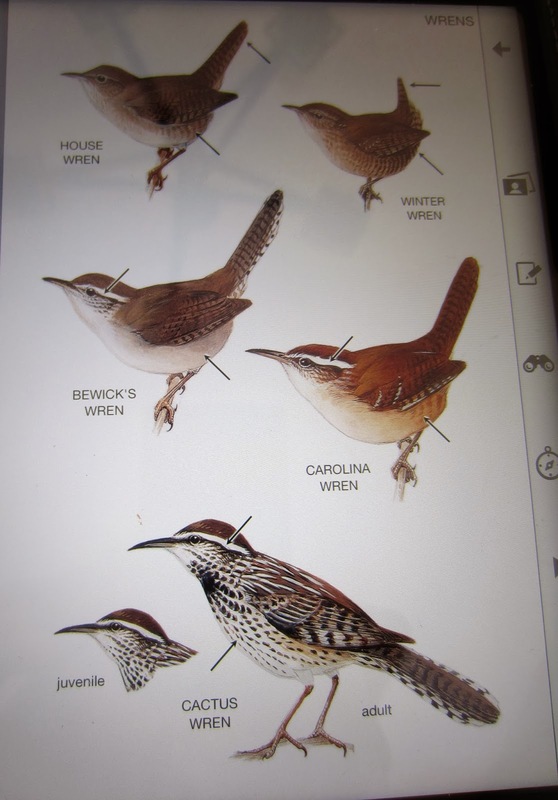 Showing us all the different kinds of Wrens. Supper time reading. A Canadian Flyer book about pioneer life in Upper Canada. 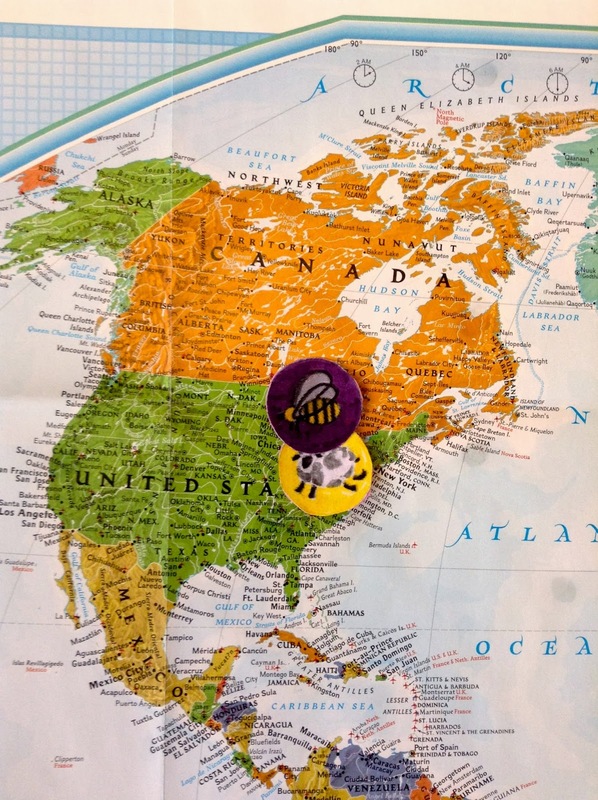 We followed the journey of the pioneers from Warm as Wool on our world map from Connecticut, through New York, across Lake Erie, landing near Cleveland and then into Ohio. We placed our story disk of the sheep on Ohio. 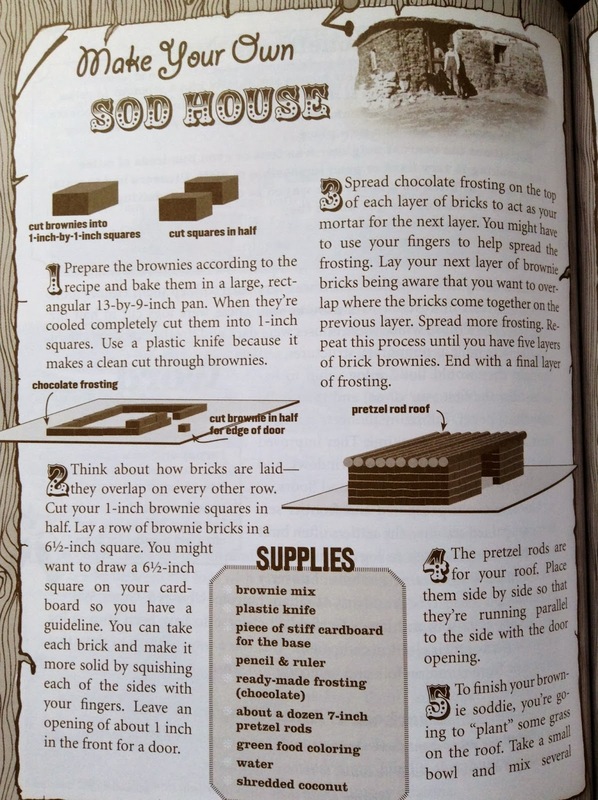 Next we made a pioneer sod house out of brownies using chocolate icing as mortar. It was fun to eat it after. We learned about sheep farming and how wool clothing is made. We talked about sheering, washing, carding, spinning and weaving wool to make clothes. We compared it to our life now and how much easier it is for us to get clothes. Because Warm as Wool includes a few similes in it's story, Abishai and I talked about what a simile is. As we read through several other story books on pioneer life, Abishai started to notice similes on his own. "Mommy, there's another simile!" he would say. Micaiah's birthday came and went. 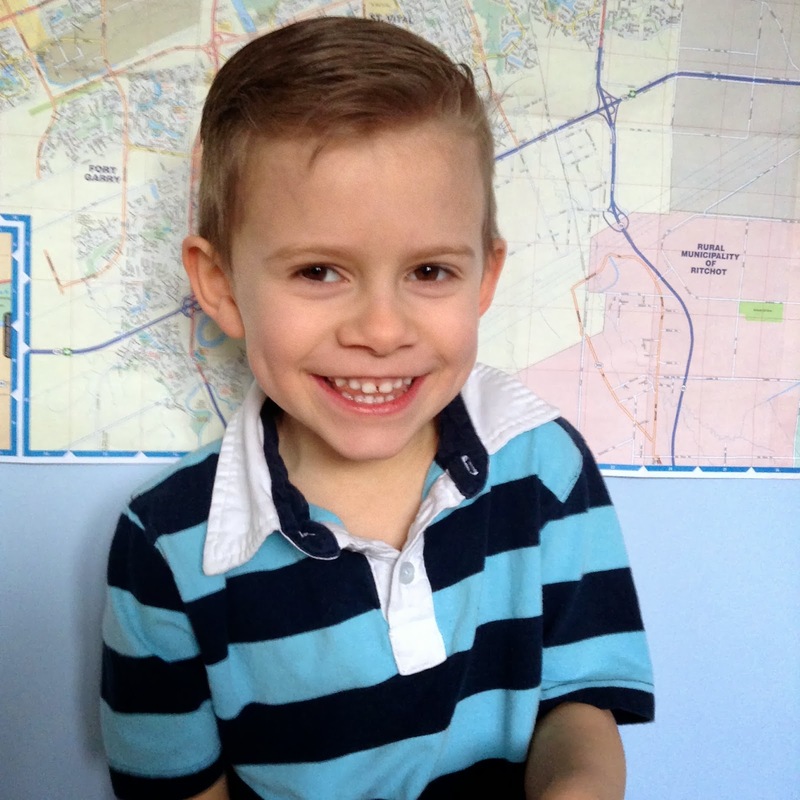 He is now 5 years old! 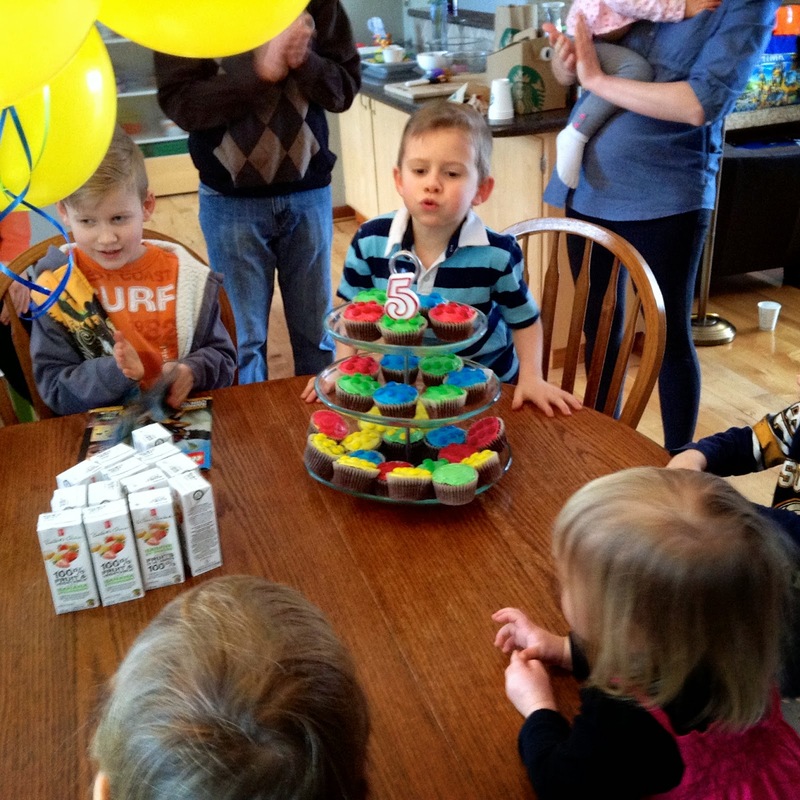 We had a house full of 26 people out to our place to celebrate. 12 children and 13 adults! I was so thankful for our house, as it held all 26 comfortably without feeling squished. Micaiah loves lego, so I put together a lego theme for his birthday. I even made lego cupcakes! One of Micaiah's presents. 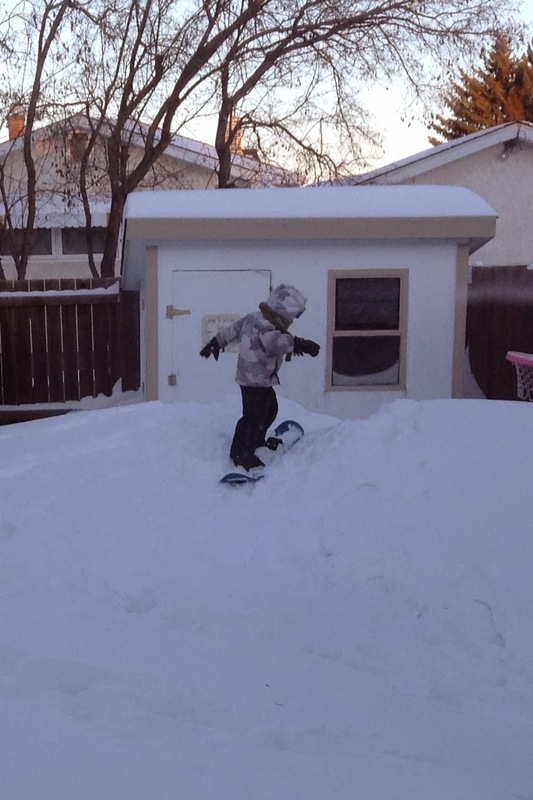 Luckily there's a small snow hill in our backyard for him to practise on. A fun surprise visit from the Giesbrecht family; our homeschooling friends. My boys had fun playing with them. The "one room" school house.